October 31, 2009 - Based on a decision in 1996, to acquire the A380, Air France on an objective criteria which proved that the performance of this aircraft was ideally suited to the Com­pany’s requirements, declared Jean-Cyril Spinetta, Chairman of the Board of Di­rectors of Air France-KLM, on Friday, took delivery of its first Airbus A380, the world’s largest airliner, which can carry 538 passengers over 13,000 km. Three of the twelve pla­nes on order will be delivered to Air France between now and spring 2010, to be closely followed by a fourth. 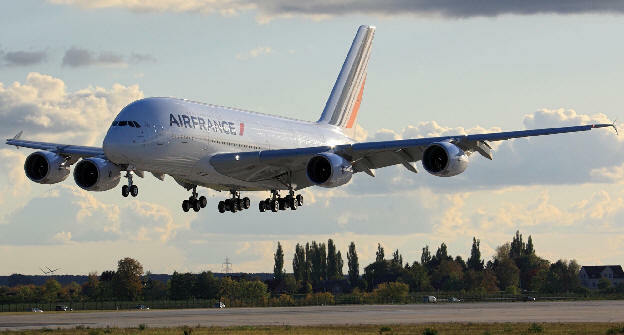 Starting on 23 November 2009, the Air France A380 will be operated on daily flights between Paris - Charles de Gaulle and New York - JFK, followed by Paris-Johannesburg during winter 2009-2010. Air France is therefore the first European carrier to operate this Superjumbo, and the first airline worldwide to offer transatlantic flights between Europe and the USA with this aircraft. The A380 is particularly well-suited to the strategy of Air France, and its size is an ideal match for the airline’s powerful hub at Paris - Charles de Gaulle. Its four state-of-the-art GP 7200 engines, its aerodynamic shape and its fuselage integrating the latest technologies make the A380 the most environmentally-friendly aircraft of its category. The A380 boasts equivalent capacity to that of a Boeing 777-200 and an Airbus A340-300 combined, while offering a 20% reduction in operating costs. Each A380 will enable Air France to save 12 to 15 million euros a year, which, in today’s depressed economic climate, provides the Company with the means to withstand the crisis. Air France will therefore be able to offer its customers even greater comfort, while keeping its costs under control. Furthermore, the perfor­mance of the A380 is in line with the Company’s environmental commitments, added Pierre-Henri Gourgeon, CEO of Air France. Air France’s A380 offers passengers three classes: La Première-First – 9 seats on the main deck – Affaires-Business – 80 seats on the upper deck – and Voyageur-Economy 449 seats spread over the two decks. In each remarkably quiet cabin, Air France has created an intimate soothing ambience, thanks to adjustable lighting suited to the different stages of the flight. Whether it is a meeting point or a relaxation area, each cabin has been fitted out with everything passengers need to make their flight experience a truly pleasurable one. 22 flight attendants are on board to serve the 538 customers. As early as 1996, Air France took part in working groups including Airbus and the main launch carriers of the A380, to design an aircraft which could meet customer expectations, and has prepared for its arrival since 2003. Air France has also worked with the airport authorities to adapt ground facilities to this new aircraft, trained both crew and ground staff and invested in appropriate ramp equipment. The new Air France A380 is the 20th A380 delivered by Airbus - 10 are already flying with Singapore, five with Emirates and four with Qantas. These aircraft are connecting four continents on 13 major international routes. Today 12 major international hub-airports around the world regularly welcome the A380 including: Auckland, Bangkok, Dubai, Hong Kong, London, Los Angeles, Melbourne, Paris, Singapore, Sydney, Tokyo and Toronto. Up to now, the A380 fleet has accumulated over 75,000 revenue flight hours in over 7,900 commercial flights. Over 2,5 million passengers have already enjoyed flying the A380. Airbus has won 200 firm A380 orders from 16 customers worldwide, including Air France. The A380's upper deck extends along the entire length of the fuselage, and its width is equivalent to that of a widebody aircraft. This allows for a cabin with 50% more floor space than the next-largest airliner, the Boeing 747-400, and provides seating for 525 people in a typical three-class configuration or up to 853 people in all economy class configurations. The postponed freighter version, the A380-800F, is offered as one of the largest freight aircraft, with a payload capacity exceeded only by the Antonov An-225. The A380-800 has a design range of 15,200 km (8,200 nmi), sufficient to fly from New York to Hong Kong for example, and a cruising speed of Mach 0.85 (about 900 km/h or 560 mph at cruising altitude). In the summer of 1988, a group of Airbus engineers led by Jean Roeder began working in secret on the development of a ultra-high-capacity airliner (UHCA), both to complete its own range of products and to break the dominance that Boeing had enjoyed in this market segment since the early 1970s with its 747. McDonnell Douglas unsuccessfully offered its smaller, double-deck MD-12 concept for sale. Roeder was given approval for further evaluations of the UHCA after a formal presentation to the President and CEO in June 1990. The project was announced at the 1990 Farnborough Air Show, with the stated goal of 15% lower operating costs than the 747-400. Airbus organized four teams of designers, one from each of its EADS partners (Aérospatiale, DaimlerChrysler Aerospace, British Aerospace, EADS CASA) to propose new technologies for its future aircraft designs. The designs would be presented in 1992 and the most competitive designs would be used. In January 1993, Boeing and several companies in the Airbus consortium started a joint feasibility study of an aircraft known as the Very Large Commercial Transport (VLCT), aiming to form a partnership to share the limited market. This study was abandoned two years later, Boeing's interest having decreased. In June 1994, Airbus began developing its own very large airliner, designated the A3XX. Airbus considered several designs, including an odd side-by-side combination of two fuselages from the A340, which was Airbus’s largest jet at the time. The A3XX was pitted against the VLCT study and Boeing’s own New Large Aircraft successor to the 747. From 1997 to 2000, as the East Asian financial crisis darkened the market outlook, Airbus refined its design, targeting a 15 to 20 percent reduction in operating costs over the existing Boeing 747-400. The A3XX design converged on a double-decker layout that provided more passenger volume than a traditional single-deck design. The A380 was used to demonstrate the viability of a synthetic fuel comprised of standard jet fuel with a natural-gas-derived component. On 1 February 2008 a three hour test flight operated between Britain and France, with one of the A380's four engines using a mix of 60 percent standard jet kerosene and 40 percent gas to liquids (GTL) fuel supplied by Shell. The aircraft needed no modification to use the GTL fuel, which was designed to be mixed with normal jet fuel. Sebastien Remy, head of Airbus SAS's alternative fuel program, said the GTL used was no cleaner in CO2 terms than standard fuel but it had local air quality benefits because it contains no sulphur.